Lean Black Belts Capstones 2018! 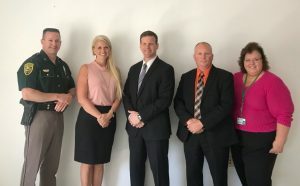 On Friday May 11, 2018 four Lean Black Belt students from the NH Department of Safety/NH State Police presented capstone projects at the BET (Bureau of Education and Training). Kelley Achenbach and Sgt. Rebecca Eder-Linell shared their important work on the “Tracking and Sustainment of Future Lean Events“. This work will provide foundational enhancements to the Lean work ongoing and new at the NH Department of Safety. Lt Jeff Ladieu provided a strong presentation on the “State of NH Enterprise Project Management Solution”. Jeff’s work is pivotal to capture project work for the aspect of Lean events. Sgt. Thomas Lencki wowed the audience on “Creating a Lean Culture in State Police“. Culture advancement for an organization is an area where continued growth and development are required. Colonel Christopher Wagner and Roberta Witham, both founders of Lean process improvement at the NH Department of Safety were in attendance to support and offer words of wisdom. All three presentations flowed exceptionally well together. Way to go! To follow NH State Police on social media go to https://www.instagram.com/nhstatepolice and https://www.facebook.com/NHStatePolice/. Graduation for the Lean Black Belts occurs on 6/1/2018, stay tuned for more updates and good work! The NH Lean Executive Committee commends the work of NH Department of Safety for their work in advancing Lean process improvement! Lean Week at NHDES: April 1-5, 2019! Local Lean Publication with Kate McGovern, MPA, Ph.D.